After an epic journey that lasted 17 years, Hugh Jackman finally bids farewell to the character of Wolverine from the X Men franchise. Logan that was released last week marks his last appearance as the genetically altered mutant with extra ordinary strength and extremely quick healing powers. During his seventeen year old journey, Hugh Jackman did ten movies playing the role of Wolverine. Out of these ten, three are Wolverine centered while in the others, Wolverine appears alongside the main cast. Hugh Jackman had been a part of the franchise since the first movie that debuted the world of X men on the big screen in 2000. There were two sequels to that series, X men 2 and X men the last stand, released in 2003 and 2006 respectively. 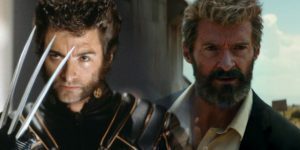 There were many mutants portrayed in the first three films however Hugh Jackman as Logan/Wolverine stole the show and it was decided to make three standalone Wolverine movies. In fact it started with the idea of one Wolverine movie where the origins of Logan were shown from when he was a child to his late twenties. It was so successful, it spawned two more Wolverine movies, The Wolverine and the last released Logan. Meanwhile Jackman also starred in the next X men movies trilogy. Although he made guest appearance in X men first class and X men Apocalypse, fan were delighted to catch a glimpse of their favorite star in their favorite avatar. Throughout the last seventeen year, a generation has grown up seeing Jackman as the Wolverine and now his decision to quit this role has left many heart broken. Although Marvel has not given up making mutant films based on the X Men world and there is a probability that some new actor will reprise the role of Wolverine, however very sorely will be Hugh Jacknman be missed. Although Patrick Stewart who plays professor X, has also said that he will not reprise the role of /Charles Xavier again. However the massive success of Logan may convince the actor to do one more movie. It has also been reported that Ryan Reynolds have been hogging the writer, fans really want a Deadpool /Wolverine movie together. Whether they will get it nor not is a difficult question to answer. The new movie Logan has been a massive hit all over the world. As Logan is the last film in this X Men series people thronged the cinema to see Hugh Jackman as a part of mutant world of X men series one last time. The movie has won over the audience and critics alike. People have been strongly saying that this is the best movie to come out of the X Men franchise, in fact they are claiming that this is the best superhero movie made as yet. So in the movie we see that the year is 2029 and Logan’s age has finally caught up with him. There has been no mutant born for the last 25 years and mutants are considered mostly extinct. Logan is living with Professor Charles Xavier, as his caregiver because he has become very weak and has seizures where he loses control over telepathic powers. Helping Logan in this task is Caliaban, a mutant tracker, who can sense and feel other mutants. They are the last of mutants as the others were accidently killed by Professor X. They are living a quiet life until approached by Gabriella Lopez, a technician at Transigen and on her request Logan agrees to take her and 12 year old girl accompanying her named Laura. Soon Logan finds out that Laura is a part of a group of kids created with the DNA of mutants so create a team of mutants. However as the children become out of control, it was planned to kill all of them off. Gabriella helped many of them escape along with Laura. It is also revealed that Laura is Logan’s biological daughter. After the murder of Gabriella, it is upto Logan to protect Laura, find the other kids and take them all to safety while taking care of Professor X on the way too. The movie has a lot of heart and emotions and it will be a great watch for the X Men fans. Hugh Jackman as Wolverine is a treat to watch as usual. Little Dafne who plays the role of Logan’s daughter, Laura, does an amazing work and is able to make her mark besides Jackman and Stewart’s stalwart performances. She can surely have her own X Men movie now that the other X Men are gone. Few actors can boast of playing a character for so long and still being loved for it and Jackman has made this accomplishment. Now it is great time for Marvel to finish off the series on this note. With every other movie having a reboot or a sequel, Marvel Studios would be tempted to make more X Men movies, either by taking in new cast or by retaining some old and some new. However if they recast Logan the new face would have to live up a very intimidating legacy set up by Hugh Jackman. Who do you think should be cast as Logan if X Men series has a reboot? Let us know your views by commenting below.